« Tired of the same old charoset? Go Sephardic! It’s Earth Day. Time to get your compost on. Do you like gardening? Do you feel like you never get enough time to dig around in the dirt here in the city? Does it bug you when you have to throw your produce scraps in the garbage? And then does it bug you even more when your garbage starts to smell? All of those problems can be solved by starting your own indoor worm bin. Gross, you say? I get that. Sort of. When I was a kid, every time it rained I would pick up earthworms off the sidewalk because I think they are kind of cool. So earthworms don’t really freak me out. If you told me I should set up a grub bin or a maggot bin, I would excuse myself from our conversation, never to return. But worms? I guarantee they are totally benign. Plus, when you toss your food scraps into a worm bin, the worms start to break them down right away, skipping the unpleasant rotting food smell you sometimes get when you open up your garbage can. Yay worms! The thing is, 26% of the trash that goes into landfills is made up of food scraps and yard trimmings. That, to me, is more disturbing than setting up a box full of worms and dirt in your kitchen (actually, ours is in the dining “area”). You can easily divert your share of that to the compost in a few different ways. If you have your own back yard, there are a variety of different bins out there that are easy to order and set up (click here for some good reviews). If you live in an apartment building, you can band together with your neighbor to start a building-wide compost program. Last year, I attended a workshop given by the Lower East Side Ecology Center (an amazing organization, I might add) on how to convince your co-op or condo board to approve a building-wide system and how to go about setting it up. However, if you don’t have much in the way of outdoor space, and your building is full of cranky people who are not down with the whole Earth Day thing, you can easily strike out on your own in the comfort of your apartment. The fanciest way to go about doing this would be to order the NatureMill Automatic Composter from Williams-Sonoma. It looks like a little composting robot and appears to do everything for you. It does recommend you keep it in a garage or sheltered outdoor space, so I don’t know what that means for apartment dwellers. If it wasn’t $400, I would buy it and report back (if you have one, I would love to know about it). Another option is to go the Bokashi route. Bokashi composting uses a combination of anaerobic organisms (like yeast and lactic acid bacteria) to break down food waste. Sounds like making yogurt. I’ve been curious about this for awhile and am planning to buy one, especially since it claims to break down meat and fish scraps (which are a huge no-no for most compost bins). If either of those options don’t work for you, consider an indoor worm bin. It doesn’t take up much space and is fairly easy to maintain (as in, you don’t need a compost-sitter when you go on vacation). We have had a bin on and off for more than a decade. I first learned about vermiculture through a workshop at the Brooklyn Botanic Garden in 1997 and started it as a domestic experiment; one that really did freak people out. Flash forward to 2011 and you have worm composting featured in a Martha Stewart publication. 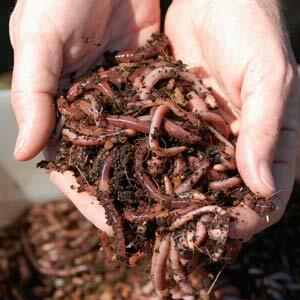 While worm composting is extremely easy, you do have to keep a few things in mind. One bin can only handle about 3 lbs of scraps per week. We monitor the amount by freezing out scraps in a container and adding them once a week. You do have to peek in the bin on a regular basis to make sure it isn’t too wet or dry and to make sure you have a nice ecosystem going on in there. That is my kid’s favorite part – they have names for them. About 3 or 4 times a year, you have to harvest the compost. 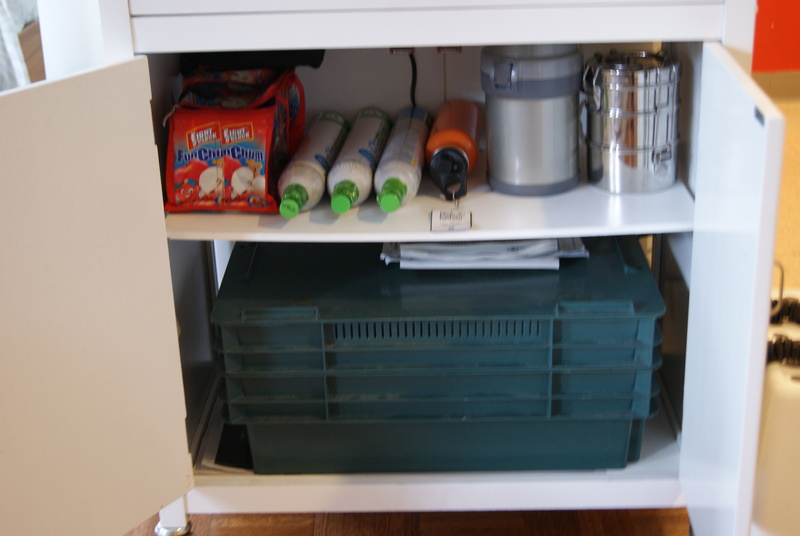 In the coming weeks, I will document the harvesting of my current bin the and setting up a new one on this blog. If you are itching to get started right away, check out the LESEC‘s instructions, or this step-by-step guide. It will be fun and I guarantee you will not be sorry when you see the amazing soil you are adding to your plants (or to the trees on the street for that matter). This entry was posted on April 22, 2011, 5:01 pm and is filed under garden, home, Kitchen Alchemy. You can follow any responses to this entry through RSS 2.0. You can leave a response, or trackback from your own site. Hi Heather and Happy Earth Day to you too! I have a Nature Mill — I got it about 7 months ago. I am extremely happy with it for the exact reason you say. I can put anything and everything in it. It is really clean, no house flies to contend with. The earthy smell fills the room in a pleasant musty log cabin way. I don’t love that it’s electric, but they say it barely uses any energy — less than 50 cents a month I believe. I miss the worms, but harvesting was a constant stress-inducer and the house fly thing was starting to take over my life.